Aizuri Quartet: Intricate Machines performed in the Weis Atrium lobby last Sunday at 2 pm. The performance began with an introduction from two of the composers who chose the music for the program. Each piece of music is special in that they each inhabit a different musical space. Every song had its own unique, dimensional voice that intertwined with other songs, making each set unique and connected. The first song began soft, like a whisper, trickling across the notes. It’s a siren song; haunting and alluring simultaneously. A later song explored the “dimensions of the breath”, from rapid pants to deep inhales and so on, using only the pluck, tap, push and pull of string instruments. 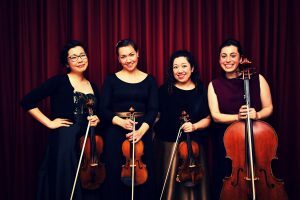 The Aizuri Quartet was a special experience. They proved that you can stretch the limits of a string quartets sound in a way that completely unravels expectations.